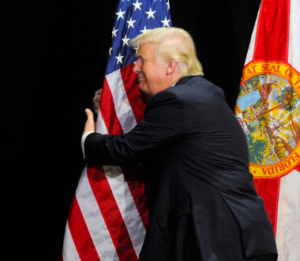 This recent picture of the President literally hugging the flag got me thinking about the critical distinction between the symbols and substance of patriotism. If you can stomach it, please watch this short video. The year is 1939, and the scene is a rally at Madison Square Garden. What’s strange, disorienting, and to me most unsettling about this rally is not its hateful content, which is all too familiar to anyone who has watched films of Nuremberg (or, more recently, Charlottesville,) but rather it’s hyper-American trappings. The Stars & Stripes are everywhere, a huge image of George Washington dominates the stage, the Pledge of Allegiance is proudly recited, and a general air of patriotic fervor fills the arena. These are Nazis, portraying themselves (and perhaps even perceiving themselves) as the truest and most ardent of Americans. How easy it is to fuse the honored and emotionally resonant symbols of our country to any value system, any at all, even the most depraved, forgetting that symbols are ultimately meaningless without the substance they are supposed to represent. If, God forbid, the sun ever sets on the American experiment in liberal democracy, I strongly suspect that our flag will continue to fly over whatever hollow republic takes its place.